DiGiCo has released the SD App, which is now available through the Apple App Store. The DiGiCo SD App is compatible with all consoles in the SD Range and allows users to take advantage of both Apple and DiGiCo’s touch screen technology. 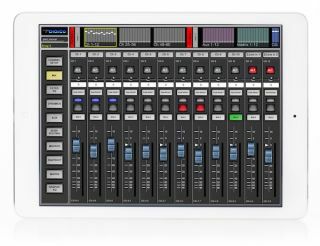 The DiGiCo SD App means that an iPad becomes a remote control surface and also an expansion of the control surface. This application takes the existing feature set and presents it in a way to take advantage of the extra screen. This allows engineers to implement very specific functions dedicated for FOH or Monitors. Aimed at installation and touring applications, the DiGiCo SD App includes a number of dedicated screens that open up the iPad surface to a selection of the consoles’ functionality. For example, there are eight macros available on the hardware buttons of an SD9, but by connecting the iPad via the DiGiCo SD App, a large number of user-defined buttons will be available; these can reside on the iPad screen, allowing for quick access, while the console remains clear to mix the show on.